3 minutes until softened but with no colour. Add the garlic and cook for a further minute until softened. a thick, smooth sauce is formed. 3. Add the Gruyère and parsley with plenty of cracked black pepper. Gently stir in the scallops and cook for 2 minutes in the sauce before adding the prawns and salmon. 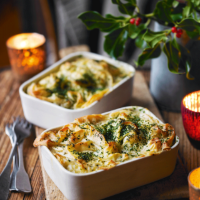 Spoon into 6 ovenproof dishes about 14cm x 12cm x 5cm deep. the filo sheets in half and brush with the melted butter, scattering with dried parsley as you go. Scrunch 2 pieces of pastry on top of each pie. 5. Place in the oven to cook for about 20 minutes until golden and crisp. Serve bubbling and hot.